Tokyo, June 8, 2018 — Casio Computer Co., Ltd., announced today the release of a new addition to its EDIFICE line of high-performance sports chronographs that combine dynamic design with advanced technology. 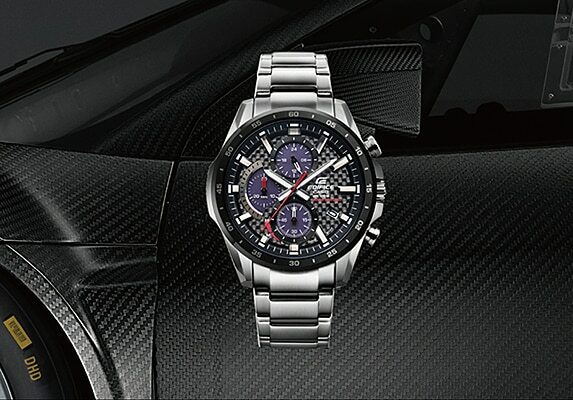 The new EQS-900 solar chronographs feature a stylish look with a carbon fiber dial. 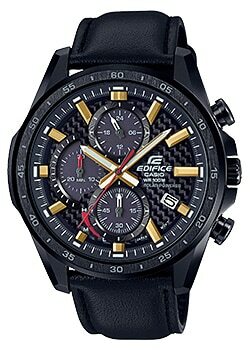 Under the concept of "Speed and Intelligence," the EDIFICE brand evokes the sense of velocity and energy that is found in motorsports, while offering diverse, ever-more advanced functions made possible by cutting-edge electronics technologies from Casio. 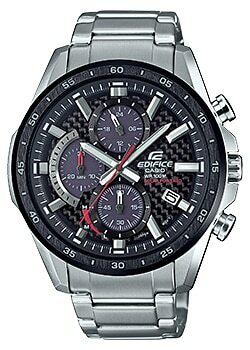 Befitting the motorsports-inspired styling of the EDIFICE brand, Casio has been an official partner of the Scuderia Toro Rosso Formula One team since 2016. The new EQS-900 evokes motorsports with a dial made from carbon fiber, which is used in Formula One racing cars for its superior stiffness and light weight. The flat bezel and face glass design, together with the attractive carbon weave and dimensional index marks, give the watch a cool, stylish look. The EQS-900 uses an original solar cell that enables the watch to be driven solely by the solar panel under the inset dials, enabling the use of a carbon fiber dial in a solar-powered watch. The EQS-900 is available with a stainless steel or genuine leather band. The model with a leather band has parts treated with black ion plating, except for the case back, which, together with the gold and red highlights, gives the watch a sleek yet brilliant look.